Corvus Pharmaceuticals closed a $75 million Series B financing yesterday. Just ten months ago, the company raised a $33.5 million Series A round. The proceeds will be used to develop its oral checkpoint inhibitor. The company was launched by former Pharmacyclics (NASDAQ: PCYC) CEO Richard Miller last year. In Pharmacyclics, Miller established the ibrutinib program. Imbruvica (ibrutinib) is estimated to generate peak sales of $6-$9 billion. With the new company, Miller turns his attention to checkpoint inhibitors, a red hot field. Checkpoint inhibitors such as anti-PD1 and anti-CTLA4 have been a revolution for the treatment of cancer. Many companies are developing candidates targeting other checkpoints (e.g., CD40, OX40, 4-1BB, TIM3, LAG3, GITR, KIR). All approved checkpoint inhibitors including nivolumab, pembrolizumab and ipilimumab are monoclonal antibodies. Corvus’s lead product candidate is a small-molecule drug which could be taken orally. It also targets a different checkpoint protein, but the company didn’t disclose which one. Small-molecule immunotherapies such as IDO inhibitors and Aduro Biotech’s (NASDAQ: ADRO) cyclic dinucleotides (CDNs) have caught the eyes of scientists and investors worldwide. Corvus could be the next big thing. Cortistatin A (CA) is a natural steroidal alkaloid isolated from sea sponges. Kyriacos Nicolaou totally synthesized the compound and characterized it as an inhibitor of CDK8 and CDK19. Yesterday, a group of Harvard scientists led by Matthew Shair published a paper in Nature, revealing the specific mechanism of CA killing leukaemia cells. It is well known that super-enhancers (SEs) play an important role in tumor pathogenesis. The BRD4 inhibitor I-BET151 downregulated SE-associated genes, thereby inhibiting cancer cells. However, the new paper suggested that CA upregulated these SE-associated genes, yet also inhibited leukaemia cells. Shair believes that cancer cells are sensitive to the dosage of SE-associated genes. The authors tested CA in approximately 400 kinases, and found that the compound inhibits only CDK8 (IC50=12 nM) and CDK19 in cells. The crystal structure of CA/CDK8 complex (Protein Data Bank ID: 4CRL) reveals the exquisite binding mode. Most kinase inhibitors do not have this type of 3D structure. The researchers measured the efficacy of CA in an AML model using SET-2 cells. The drug afforded a 71% tumour volume reduction, also with no loss in body weight. CA was totally synthesized via 32 chemical steps. It should be very difficult to make the compound on a large scale. Scientists are trying to find less complex structures that work just like the natural compound. J Am Chem Soc. 2006, 128(10), 3148-3149. Angew Chem Int Ed Engl. 2009, 48(47), 8952-8957. Anti-VEGF therapies including Avastin (bevacizumab), Lucentis (ranibizumab), Eylea (aflibercept) and conbercept have reformed the treatment of wet age-related macular degeneration (AMD). Both Lucentis and Eylea sold billions of dollars per year. Conbercept, developed by Kanghong Pharmaceutical (SZSE: 002773), also sells well in China, generating CNY 110 million in the first half of 2015. Currently approved anti-VEGF products for AMD are monoclonal antibodies and fusion proteins. Patients require repeated eye injections of anti-VEGF biologics to control their disease. An oral treatment with similar efficacy and safety will be welcomed by many patients. That is what Tyrogenex is doing right now. Tyrogenex’s lead compound is called X-82, which inhibits VEGFR, PDGFR, FLT3 and KIT. The compound is currently in Phase II trials for wet AMD and solid tumors. In June 2014, the company received $15 million in Series D financing from Brace Pharma. The funding is used to support the Phase II trials. The Phase I results of X-82 for AMD were presented at the 15th EURETINA Congress. The trial enrolled 35 previously treated patients with wet AMD. Four dose levels, ranging from 50 mg to 200 mg, were evaluated. Of the 25 patients completing the full 24-week treatment, 15 required no intravitreal injections of Lucentis, and had a mean visual acuity improvement of +5.3 letters. The Phase I results were clinical meaningful. 43% (15/35) of patients maintained or improved their visual acuity scores, and did not require any injections of Lucentis. What really concerns me is the safety profile of X-82. As we know, multikinase inhibitors (e.g., sorafenib, sunitinib) could result in various adverse events. Lucentis and Eylea are well tolerated because of their high selectivity and local injection. X-82 is derived from sunitinib, but X-82 has a shorter half-life than sunitinib, resulting in less tissue accumulation. Indeed, X-82 caused fewer side effects than sunitinib. There were still three patients experiencing transaminase elevations within the first month of starting treatment. Only 71% (25/35) of patients completed the full 24-week treatment. Tyrogenex and its sister company, Xcovery, were founded by Dr. Chris Liang (梁从新) who emigrated from China in 1984. Liang is credited as the co-inventor of sunitinib. In 2007, Xcovery was one of the most promising biotech companies in the world, but it looks just so-so today. In October 2014, Beta Pharma invested $20 million into Xcovery while gained China rights to X-396, an ALK inhibitor. AnewPharma, a Shanghai-based company, is responsible for developing X-82 (CM082) in China. I am at the 2015 Annual Meeting of Chinese Society of Clinical Oncology in Xiamen, Fujian Province today. Here are some takeaways. Anlotinib (AL3818) is a multi-target tyrosine kinase inhibitor (TKI) developed by Chia Tai Tianqing. In a Phase II trial (CTR20130315), the drug provides significant survival benefit in NSCLC (non-small cell lung cancer). The trial enrolled 117 patients with advanced NSCLC who had failed two previous treatments, 60 patients with anlotinib and 57 patients with placebo. Anlotinib significantly improved median PFS (4.8 vs 1.2 months, p<0.0001) and median OS (10.3 vs 6.3 months, p=0.075). The drug also improved ORR (13.3% vs 0.0%) and DCR (93.33% vs 47.37%). More patients experienced Grade 3/4 treatment-related adverse events with anlotinib (21.67% vs 5.26%). The most commonly reported treatment-related adverse events were hand-foot syndrome and hypertension. Hutchison MediPharma presents Phase II (CTR20130968) results of fruquintinib (HMPL-013) in metastatic colorectal cancer (mCRC) at the CSCO2015. A total of 71 patients who had failed at least 2 prior lines of chemotherapy were enrolled in the trial, with 47 in the fruquintinib arm and 24 in the placebo arm, respectively. Fruquintinib improved median PFS (4.7 vs 1.0 months, p<0.0001) and median OS (7.6 vs 5.5 months). There was one response reported in the fruquintinib arm. The DCR in the fruquintinib arm was 68.1%, compared with 20.8% in the placebo arm. The most commonly reported treatment-related adverse events were hand-foot syndrome and hypertension. Dose interruption and dose reduction due to adverse events was reported to 51.3% in the fruquintinib arm. Anlotinib is a cediranib me-too first discovered by Advenchen Laboratories (patent: WO2008112407). The company created a broad TKIs portfolio and established collaboration with Chinese Big Pharma. Tianqing’s NSCLC results are encouraging, but a Phase III trial is warranted to confirm these findings. Bayer once tested multi-target TKI sorafenib in NSCLC in a Phase III trial (MISSION). Sorafenib failed to demonstrated improvement in OS, though an improvement in PFS was observed. The Phase II results of fruquintinib are not as good as the Phase Ib data presented at the ASCO2014. In the previous Phase Ib trial, 23.2% (13/56) of patents achieved a partial response or a minor response. The DCR was 80.4%, and the 9-month survial rate was 50%. In the Phase II trial, however, response rate dropped to 2.1%, the DCR dropped to 68.1%, and the median OS dropped to 6.3 months. Regorafenib, another multi-target TKI, has been approved for the treatment of mCRC. According to the CONCUR trial in Asia, regorafenib significantly improved median PFS (3.2 vs 1.7 months, p<0.0001) and median OS (8.8 vs 6.3 months, p=0.002). The DCR also favored regorafenib over placebo (52% vs 7%). The most commonly reported treatment-related adverse events were hand-foot syndrome and hypertension. The efficacy and safety of fruquintinib and regorafenib are extremely similar. Hengrui and Tianqing are developing their own TKIs for the treatment of mCRC. Hengrui presented Phase II results of famitinib at the ASCO2015 Gastrointestinal Cancers Symposium. The drug significantly improved median PFS (2.8 vs 1.5 months, p=0.004) and DCR (59.8% vs 31.4%). However, no difference in OS (7.5 vs 7.6 months) and ORR (2.2% vs 0.0%) was observed. The incidences of serious adverse events for the famitinib and placebo groups were 11.11% and 9.09%, respectively. The safety profile of famitinib seems better than competitors. Hengrui is running a Phase III trial to further evaluate the drug. Tianqing is testing anlotinib in a large Phase II trial. Tianqing can use the Phase II results to file NDA. If all four TKIs are approved, these drugs have to compete with each other. Gleevec (imatinib) is a breakthrough therapy that turns deadly chronic myeloid leukemia (CML) into a manageable disease. However, only 5% of patients achieved complete molecular response (CMR) that no Bcr-Abl mRNA is detectable in the marrow. A group of French researchers added Actos (pioglitazone) to imatinib on two patients diagnosed with both diabetes and CML. Both two patients had never reached CMR in spite of long-term imatinib treatment. Amazingly, they achieved CMR after 1 year of pioglitazone addition. Before filing a formal clinical trial application, the researchers prescribed pioglitazone off-label to a third CML patient, this time non-diabetic, who never reached CMR either under long-term imatinib therapy. Finally, CMR was achieved after 6 months of pioglitazone addition. All patients achieved sustained CMR up to 4.7 years after withdrawal of pioglitazone. The authors note that activation of PPARγ by pioglitazone reduces expression of STAT5, while imatinib inhibits STAT5 activation by Bcr-Abl pathway. 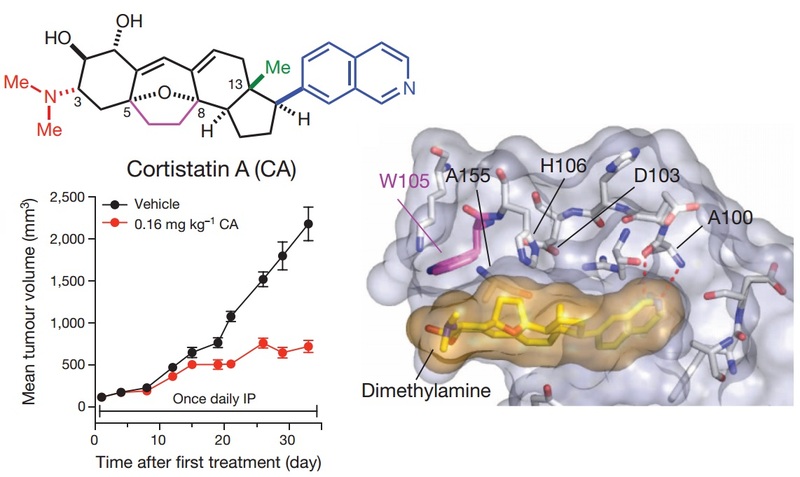 Imatinib alone is sufficient to kill the bulk of cancer cells, but fails to bring STAT5 activity below a threshold for killing cancer stem cells. 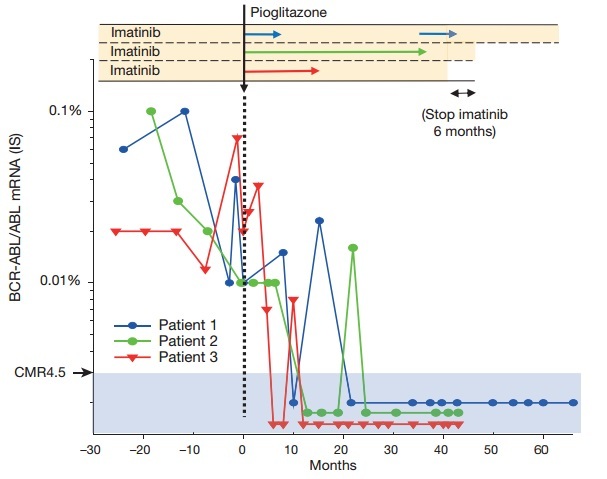 Pioglitazone is effective at doing so in synergy with imatinib. The trial is too small. It is difficult to know if the results would reproduce in a lager trial. It is also unknown whether CMR offers significant survival benefit. Imatinib already enable 90% of patients to survive for 5 years. A long-term, larger trial directly comparing the combination therapy versus imatinib alone is warranted. J Clin Oncol. 2008, 26(20), 3358-3363. In the summer of 2010, Novartis and the University of Pennsylvania began testing their anti-CD19 CAR-T therapy, CTL019, in patients with relapsed and refractory chronic lymphocytic leukemia (CLL). The mature results from the trial were published in Science Translational Medicine. Dr. Carl June led the study. The trial enrolled 14 heavily pretreated CLL patients. These patients were treated with CTL019 at doses of 1.4 × 10^7 to 11 × 10^8 cells. Four patients had a complete response (CR), and additional four patients had a partial response (PR). Six patients did not respond to the therapy and progressed soon. One of the CR patients died at 21 months due to infections after removal of the skin cancer on his leg. The three other patients are still alive with no signs of recurrence. At the time of the report, they have survived for 28, 52, and 53 months after receiving CTL019. Two of the PR patients died of disease progression at 10 and 27 months. One of the PR patients died from a pulmonary embolism (肺动脉栓塞) at 6 months. The other patient was switched to other therapies due to the disease progressed at 13 months. The CR rate in CLL was much lower than that in ALL (acute lymphocytic leukemia). No CLL patient with CR has relapsed, while in a previous ALL trial, 37% of CR patients have subsequently relapsed. The CAR-T cells remain in CLL patients’ blood and retain their ability to hunt for cancer cells beyond four years. Sci Transl Med. 2015, 7(303), 303ra139. Anti-CD19 CAR-T therapy has demonstrated potent clinical efficacy in patients with B-cell leukemia and lymphoma. However, this therapy faces many challenges in the context of solid tumors. Most proteins overexpressed on cancer cells may also be expressed on normal cells. CAR-T cells cannot distinguish cancer cells from normal cells. Five years ago, one patient died after the treatment with anti-HER2 CAR-T due to the expression of HER2 in lung tissues. CD19 is not known to be expressed on any healthy tissue other than B cells. Even though such CAR-T cells attack cancer cells and normal B cells, patients can live without B cell for a long time. Further, CD19 is not expressed on hematopoietic stem cells, and therefore B cells should return when the CAR-T cell is no longer present. This may not be the case with solid tumors. To make CAR-T therapy applicable to solid tumors, Dr. Laurence Cooper of ZIOPHARM Oncology (NASDAQ: ZIOP) developed CAR-T with reduced affinity, and showed that these CAR-T cells could distinguish cancer from normal cells. In other words, Cooper’s CAR-T cells could minimize the “on target off tumor” toxicity in mice. The researchers chose wild-type EGFR as a target. The protein is overexpressed glioblastoma but is also found at low levels on certain normal cells. Two CARs were generated from cetuximab (cetux) and nimotuzumab (nimo), respectively. Cetux has higher affinity for EGFR, while nimo has low lower affinity. The researchers then tested the anti-EGFR CAR-T cells in NSG mice with glioma. Cetux-CAR-T cells and nimo-CAR-T cells both significantly inhibited tumor growth. However, the cetux-CAR-T cells caused significant toxicity, resulting in significant death of mice within 7 days of T-cell infusion. The nimo-CAR-T cells have no apparent toxicity. NSG mice lack mature T cells, B cells, and NK cells, and are also deficient in multiple cytokine signaling pathways. It is unclear whether CAR-T with low-affinity could reduce cytokine storm, a common life threatening side effect associated with CAR-T therapy. The researchers used cancer cells that express a median density of 240,000 molecules of EGFR/cell to establish mouse model. In patients, it should be far more complicated. Mol Ther. 2010, 18(4), 843-851. Cancer Res. 2015, doi: 10.1158/0008-5472.CAN-15-0139.